As we in the northern hemisphere prepare for the arrival of winter, we go through certain rituals – put the patio umbrella away, drain the hoses, wash the windows, winterize the car… you get the idea. For we who market, fall has a different meaning. Perhaps you’re getting ready for holiday or end-of-year promotions, or supporting customers who are doing so. Maybe your business is more spring/summer-oriented (like our friends at Bobbex, who make rabbit and deer repellents for your garden), and it’s time to regroup and start planning for next year. Whatever kind of business you’re in or what tasks are already on your list, we’re suggesting you add one more. Make it your annual fall cleaning ritual – list cleansing. Yes, it’s time to get your email list verified and cleaned up. Take a critical look back over the past year. Do any or all of these scenarios apply to you? Your open rates have been declining. While we do not advocate using open rate as a success metric for your email marketing (see our post: Don’t Be Seduced By Your Email Open Rate), it is important to note if your open rate has been dropping off over time. This could be an indication that your list has been overtaken by trick email addresses. See #3 below. Your open rate is consistently below 30%. Low open rates can indicate that your emails are not reaching their intended inboxes, which could be a factor of a bad list. While a 30% open rate might seem like a lot, keep in mind that means that 70% of your list isn’t seeing you at all. A number that large deserves further scrutiny. You bought a list or lists, from a list broker. No matter how reputable the list broker seems to be, you may have missed a very important step before uploading that list and starting to mail to it. Your list is old. If you’ve had the same base list for a number of years, there have most certainly been changes with a lot of those people. With free accounts, users just abandon them (I’ve done it myself – pretty sure my AOL account is still out there somewhere). With business accounts, some organizations never delete an old email address; they just deactivate it. In other words, you can’t depend on bounces to keep your list free from defunct email addresses. We’ve discussed before how sending the same email to everyone on your list every time can cause open rates to drop (including this recent post), so we’re not going to cover that here. What we’re dealing with here is one specific thing beyond your content that impact your email marketing success – the quality of your list. The difference between the Impressionwise report and the reports we’ve gotten with other list cleansing services is pretty amazing. Seeing exactly which emails are Spam Traps, versus Moles, etc. actually helps us stay out of trouble, and make sure we’re not emailing any email addresses that are ‘unsafe’ or could damage our sender reputation. You’ll see from this summary that this list had 18 spam trap emails and 94 moles… and that is helpful. They give you all of this as downloadable CSV (comma-separated-values) files, so you can take action. We added the Suppressed CSV file to the Do Not Email list — so they will NEVER be emailed again. And we could examine every one — we updated the CERTIFIED safe to send and the DISCRETIONARY, as well as the SUPPRESS list — with EXACTLY the reason that email address is on the list. You can read the report and get some answers to that question, yes. However, it really boils down to this: the more you email to people who aren’t engaging with your emails, the fewer people will receive your emails and your open rate will drop. When you email to spam traps, moles, and seeds, you’re also sending signals across the interwebs to the servers that care about such things that you’re not actually engaging with your list. Again, while open rate is not the metric to celebrate, it is the metric to watch. The smaller it gets, the fewer clicks you’ll get. The fewer clicks you get, the less engaged your list is. The less engaged your list is, the more the email delivering services will think your emails are not worthy of delivering. It’s a downward spiral. List cleansing on a regular basis is a very good – and inexpensive – insurance policy. If you’ve been building your list for several years and you’ve never cleansed it, I recommend that you get your list cleansed right away. Depending on how fast your grow your list, establish a regular rhythm to get your list cleansed. It will keep you out of trouble and help maintain your sender reputation. Schedule it annually so you’ll remember – one of your fall cleaning rituals, perhaps. And if you ever purchase a list? Get it cleansed before you use it — so you don’t end up hurting yourself and your marketing efforts, but instead leverage the good contacts in the list right up front. A lot of those lists come to you with spam traps and moles built right in. Find out before you start emailing that new list. 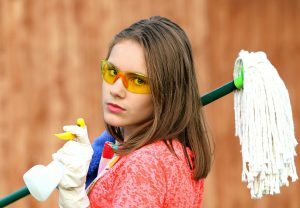 You can get a list of 15,000 email addresses cleansed for less than $200 at Impressionwise.com and through other list cleansing services. If cleansing your list results in more clicks, that’s a great investment and a huge win. Don’t you think?